We were fortunate to meet friends from Mythicist Milwaukee two months ago at the Reason Rally, when they were live-streaming the entire Rally. Fritz Blandón took some time from his schedule in Milwaukee to give UnitedCoR an exclusive interview about his life growing up in a religious home in Nicaragua as well as to tell us about some vital non-theistic work being done in southeast Wisconsin. UnitedCoR: Have you always been a non-theist, or did you come from a religious background. Please tell us a bit more about your story. Fritz Blandón: I grew up in a religious household, but individually, even at the age of 6, I remember questioning the veracity of Biblical claims with my superiors. My family is Nicaraguan and is comprised heavily of two Christian denominations, Catholic and Moravian. Historically, my family has been very religious in faith and practice. As a child in Nicaragua, I regularly went to Mass or service at the different denominational churches, depending on which side of the family I was with. After immigrating to Vicksburg, Mississippi from Nicaragua at the age of six, I began attending school at Immanuel Baptist Church and participated in Sunday school at Warrenton Independent Baptist Church. It was during my time at Immanuel Baptist school, that I was first told about Jesus walking on water, and instead of amazement, I remember being perplexed, asking my teacher questions such as, ‘How is that possible?,’ ‘How do you know it really happened?,’ and ‘Has it happened since?’ The answers given to me by my teacher left me unconvinced, full of other questions, and skeptical ever since. As an added note, last Christmas I received a brand new Bible from my grandparents with the recommendation that I read it every day, which I really appreciated, but for different reasons—knowledge is power. UnitedCoR: Wisconsin seems to be an interesting place with a mix of people who affiliate with religion. Do you feel comfortable being public about non-belief? Fritz Blandón: For self-preservation and job security reasons, I do not yet feel comfortable being completely public and vocal about my non-belief in my home state. For most of the time, since co-founding Mythicist Milwaukee in 2013 with Sean Fracek, I have utilized my middle name, Antonio, whenever speaking or writing about my work. As a high-ranking public figure within the field of urban education, I work heavily and closely with Latino/Hispanic and African-American populations that historically have been very intimate with their faith. I believe it is important, despite perceived changes towards a more secularized society, that I keep my work with Mythicist Milwaukee separate from my personal pages and away from my work in public education. With these current changes for instance, a strong effort from certain entities to push things back to a more conservative platform have emerged, including demanding that lawmakers use religion as a guide when legislating and encouraging the teaching of the Bible in public schools. My work with Mythicist Milwaukee speaks to my belief that Jesus Christ, Moses, and Muhammad, along with many other religious figures are mythical or at best, historical figures that have been heavily mythologized. It is also important to note that despite nearby capital city Madison being the hub for the Freedom from Religion Foundation, over half of Wisconsinites claim affiliation with a religion, a rate higher than the national average. Also, according to a recent February 2016 Marketwatch.com article, Milwaukee is the metropolitan area with the 3rd fewest people without any religious affiliation at 17% (2015). To add, a Huffington post article from 2012 listed Milwaukee as the 17th most religious city/area in the country. 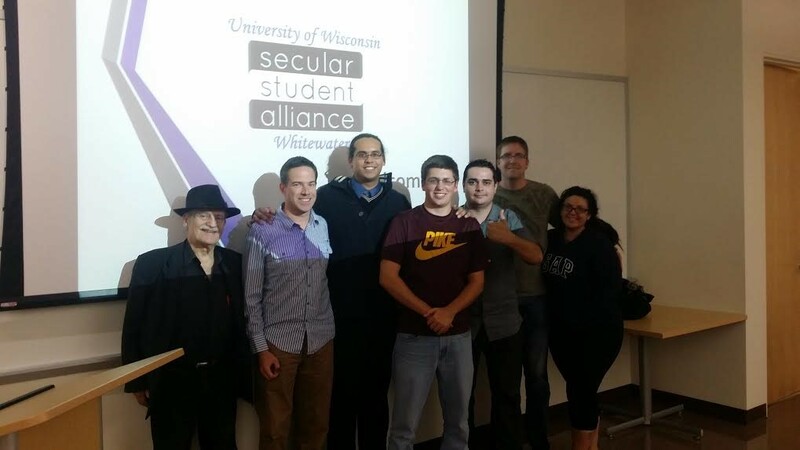 Mythicist Milwaukee presentation for the Secular Student Alliance of the University of Wisconsin-Whitewater. UnitedCoR: We’ve really enjoyed following the Mythicist Milwaukee blog. Tell us more about the non-theist community work you’ve been doing around Milwaukee. 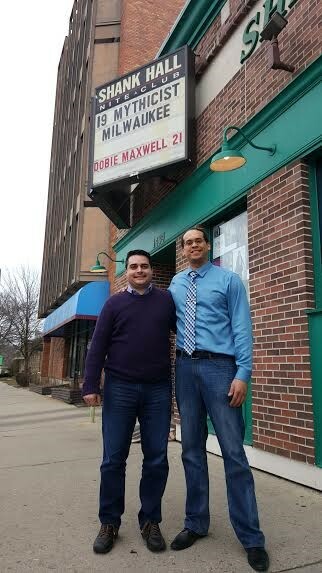 Fritz Blandón: As the current Vice-President and co-founder of Mythicist Milwaukee, I have done a lot of work around the local community with respects to sharing information and advocacy for the secular community. Thanks to increased membership, volunteers within the organization, partnerships and activism we are continuing to expand our scope. I am currently active on various social media outlets and active locally with weekly and bi-weekly MeetUps where live presentations and discussions occur on various topics related to religion, science, politics and society in general. I have spoken at local and regional events, created a documentary on the adhan in Hamtramck, MI with my partner Sean, and have been interviewed by multiple local news outlets regarding the work of Mythicist Milwaukee. I have helped facilitate multiple conferences with world-renowned speakers and I also started a weekly podcast that with the addition of multiple energetic activists which has boosted the Mythicist Milwaukee name nation-wide and world-wide. 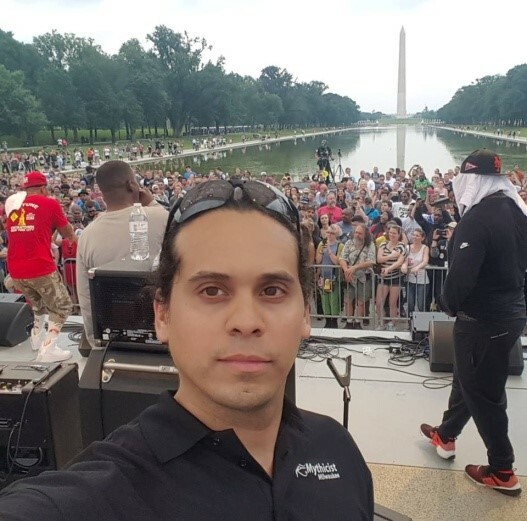 I recently received some visibility nationally at the 2016 Reason Rally with my work helping to organize and facilitate the Wu-Tang Clan performance. Currently, the Mythicist Milwaukee team is collaborating with a local filmmaker, Jozef Kyle Richards to make a feature documentary film “Batman and Jesus” that looks at how mythology changes over time and takes both a satirical and serious look into the justification for the claim that Jesus Christ is a mythological figure. Representing Mythicist Milwaukee at the 2016 Reason Rally VIP dinner. 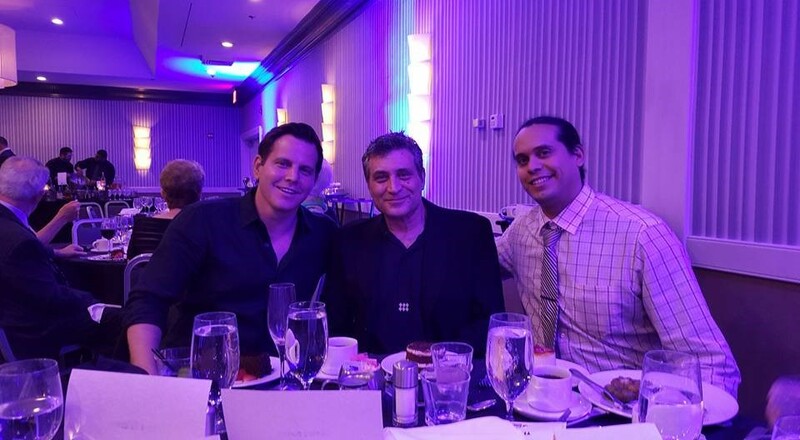 Sitting with secular and social activists Dave Rubin and Paul Provenza (left to right). UnitedCoR: You’ve also got the Mythinformation Conference coming up in a couple of months. You’ve seen other conferences around the country. What’s going to make this one different than the others? Fritz Blandón: The upcoming October 21st Mythinformation Conference will be the biggest event yet for the Mythicist Milwaukee team, thanks to local funder Mario Quadracci. This conference will be different because it brings together two of the world’s biggest and most vetted New Testament scholars, Dr. Robert Price and Dr. Bart Ehrman to exclusively discuss the hotly debated topic for the existence of a historical Jesus Christ. This Milwaukee event will be the second in a new series titled Buzzed Belief, but at a much larger and exclusive venue. It will be held at historic Turner Hall in downtown Milwaukee, thus bringing Mythicist Milwaukee in league with national acts. 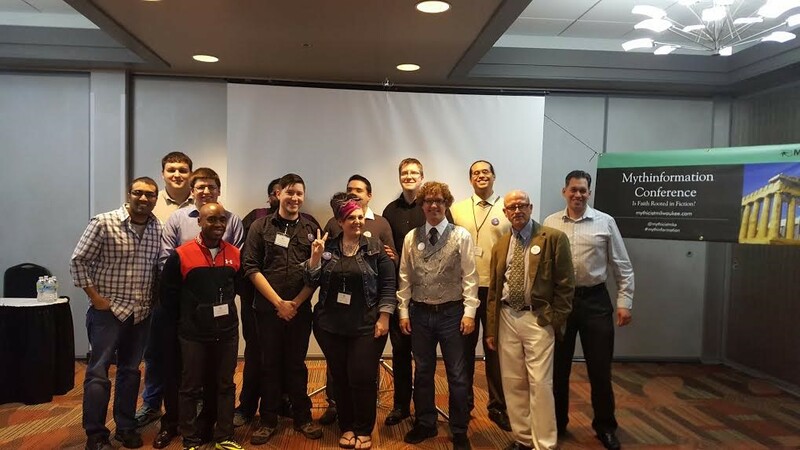 First Mythinformation Conference with the Mythicist Milwaukee team and event speakers Dr. Richard Carrier, Hemant Mehta, James Kirk Wall (no specific order). First Buzzed Belief event and second Mythinformation Conference. 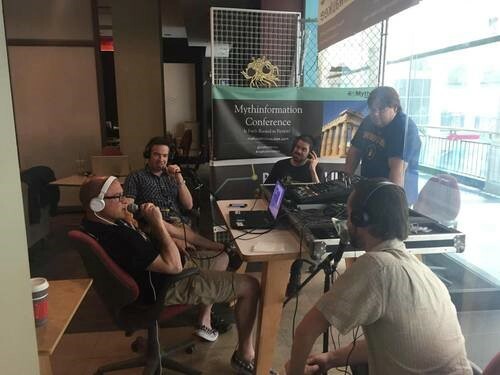 UnitedCoR’s Jase on the Mythicist Milwaukee podcast, joined by The Mythmeister and the Duly-Appointed Deacon of Doubt. We appreciate Fritz’s time for giving us an interview. If you’d like to know more about Mythicist Milwaukee, check them out on Twitter, Facebook, their blog, YouTube, as well as their podcast (UnitedCoR’s Jase was featured two months ago). We wish you well with the upcoming conference! Previous Previous post: Religious Freedom Restoration Act (RFRA): Religious Freedom or License to Discriminate?